I’m always on the watch for a new case idea. The problem being is that I like the portability of the iPhone without a case, but like the features of many of the specialty cases. The Survivor from Griffin Technology is the case I use when I might be someplace the iPhone will get handled roughly. It does bulk up the iPhone 4 a lot though. New to me is the Diff Case. The case is less about drop protect, which it does, rather it is more about protecting the faces and being able to mount your iPhone to a tripod. 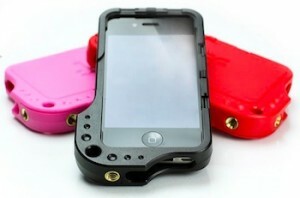 The Diff Case is currently $30, available directly from the manufacture. The main ‘features’ of the Diff case is the doors that cover the flat sides of the iPhone 4, which can be opened tall or wide, and has a opening for the camera to work with the case still on. The two tripod mounts make it easy to set up for still or long exposure photographs.